If you want to go camping near Disneyland, the first thing you need to know is that Disneyland does not operate any RV campgrounds. The places listed below are your best - and closest - options. The Disneyland area is very busy, especially during summer and school holidays, and all forms of lodging fill up fast. That includes these RV parks. It is recommended you make reservations as far in advance as you can. However, many of Disneyland camping places charge cancellations fees that get higher if you cancel with less than two weeks' notice. If you plan to drive your RV to Disneyland, oversized parking is a little more expensive than automobile parking, but still reasonable when compared to the cost of tickets. To park in the oversized vehicle parking lot, use the main entrance to the Mickey & Friends Parking Structure, which is south of the Disneyland Drive and Ball Road intersection. Some of the parks below have Disneyland shuttles or are on the Anaheim Resort Trolley route. Before you count on using the shuttle, check its schedule to be sure it's flexible enough for your needs. Anaheim Harbor is the closest campground to Disneyland. Their spaces can accommodate 40-foot RVs with bump outs. They have full hookups and a heated swimming pool, a laundry room, free WiFi, and cable television. You can even see the Disneyland fireworks from your parking spot – although they will be much more beautiful inside the park. Anaheim Harbor also has smaller campsites and places where you can camp in a tent (4 people max per tent site). It's on the Anaheim Resort Trolley route, which means you don't have to take your vehicle out and drive it to the park. Anaheim Resort RV Park has full hookups and is one mile from Disneyland. They have a swimming pool and hot water spa, free WiFi, and cable TV service. Their full hookups include 20, 30 and 50 amp electricity. And their pull-thru spaces can handle rigs as long as 65 feet. Tent camping is also allowed. Good Sam members save 10% on their fees. It's about a mile from the parks. They have a Disneyland shuttle, which runs every 20 to 30 minutes. In a 795-acre natural wilderness area along the Santa Ana River, this campground has lots of amenities that include a swimming pool and store. They also have cabins for rent. It's a little further from Disneyland than some of the other parks (about a 30-minute drive), and you will probably want to drive your own vehicle to get the park. 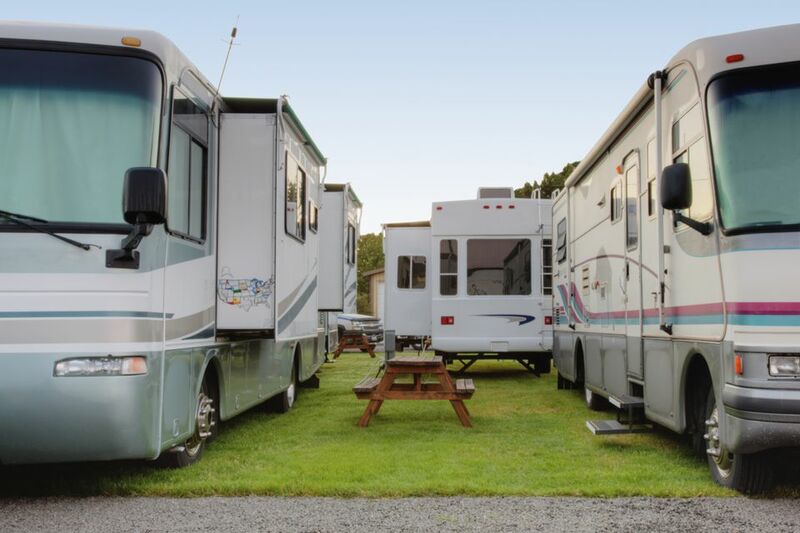 Orangeland has 195 paved RV camping sites. They have wide, pull-thru sites, a swimming pool and spa, free WiFi, and cable TV. They allow pets (for a small additional per-day fee) but have a rather long list of breeds that aren't allowed. The park is a little less than two miles from Disneyland, about a 10-minute drive away. This RV park caters to seniors but is open to visitors of any age. It's in Tustin, about a 20-minute drive from Disneyland. Their lots are spacious, a full 8 feet wide and 29 to 40 feet long. They provide full utility hookups and a secure environment. Newport Dunes is a bit further from Disneyland than the parks listed above, near the coast in Newport Beach, which is about a 30-minute drive from Disneyland. It's a 110-acre resort that includes a mile of beachfront property with amenities such as a waterpark, swimming, and a playground on the beach for the kids. Their sites can accommodate big RVs, and they have free WiFi, a fitness room, and swimming pool. They can even wash and wax your RV. If you don't have an RV, they also have cottages for rent.